Esquire, August 1936: “The old summer formal combination of blue jacket and white flannels got the gong because of its obvious incongruity with summer evening dresses. 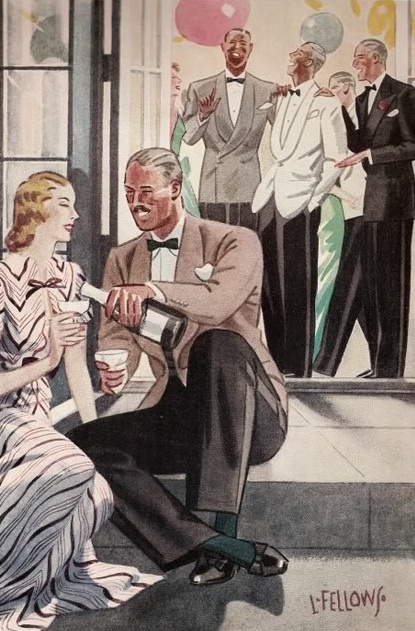 “Hence the white dinner jacket was welcomed with open arms and although its vogue was threatened momentarily by the ridiculous mess jacket craze, it has since gained ground each season, its position being strengthened rather than weakened by the introduction of such colour touches as the use of dark green or midnight blue bow ties with matching cummerbund and hose. As ever, the discussion over the dominant colour in evening wear is more interesting than the accessories. I can’t condone green bow ties or cummerbunds, but Burma or grey is genuinely interesting. Just like brown and midnight blue, mohair and silk, it adds depth and subtle interest. You can follow the discussion on Variations on the summer dinner jacket by entering your email address in the box below. You will then receive an email every time a new comment is added. These will also contain a link to a page where you can stop the alerts, and remove all of your related data from the site. Many thanks to those that sent in the colour version of the picture. this blog is hands down the BEST menswear blog online. Your archive by month with the title of your posts is very helpful (most archives are impossible to navigate) and the posts on the right-hand side of the screen with your experience with tailored clothes are awesome. and of course your knowledge of clothes is astounding. The mess jacket or the Spencer jacket still lives on in navies around the world but the civilian variant is extinct in Europe, however they are still used in South America as a hot weather substitute for white tie when a regular dinner jacket is seen as to informal. In my opinion, a cream coloured Spencer jacket with peak lapels worn with black tie, cummerbund and trousers is quite dashing if you add a single red flower in the buttonhole. Even though you sadly can get away with that attire in this day and age, you can always dream of a new era where those formal events are not as rare as they are today. Can I ask your advice about a white dinner jacket. I am thinking of having one made for use in the summer. I was planning on a single-breasted peak lapel with one button. What advice would you have about cloth type and weight? Secondly, in terms of the lapels, would you have the same as the jacket, or use a moiré silk or cream grosgrain?